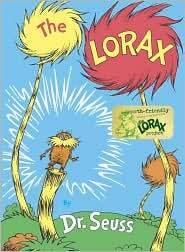 ﻿ book pick: The Lorax by Dr. Seuss. book pick: The Lorax by Dr. Seuss. A fun little read, and a sweet lesson on loving our earth. It was published in 1971, many years before “going green” became trendy, even though it was always the right thing to do. Will make you smile, will make you think, and your kiddos will love it, too. So today, honor Mother Earth. Get outside, ride a bike, take a walk, plant something, recycle something, re-use something, and pick up a copy of the Lorax. By Dr. Seuss, of course. Oh, I love Earth Day. So happy that it’s sunny outside to celebrate. Thanks Dr. Seuss for a wonderful book. Hooray for The Lorax. I have seen a new edition in Australia that is printed on 100% recycled paper.